We are counted among the top notch Manufacturers, Exporters and Suppliers of Sulphuric Acid from India. Our highly effective Sulphuric Acid is processed under controlled conditions using optimum grade base chemicals. 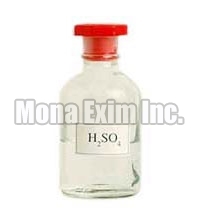 It is a corrosive strong mineral acid with the molecular formula H2SO4. The Sulphuric Acid is a pungent-ethereal, colorless to slightly yellow viscous liquid which is soluble in water at all concentrations. Further, Sulphuric Acid finds wide application in domestic acidic drain cleaner, electrolyte in lead-acid batteries and various cleaning agents.